Morgan Stanley really, really loves Tesla. Against long odds, Elon Musk has built a $30 billion electric car company that has disrupted the 100-year-old auto business. But that would be nothing compared with Tesla's (TSLA) next act. At least that's the thinking of Morgan Stanley's global auto team. Tesla is "uniquely positioned to dominate" the auto business and may even lead a radical "revolution" in the way car companies operate, Morgan Stanley analyst Adam Jonas writes in a research report on Monday. Jonas is betting that in the future all major car companies will make almost 100% of their sales from "robot-driven/shared cars." Other companies like Google (GOOGL), Apple (AAPL) and Uber are known or rumored to be making investments in driverless cars. But Tesla is in the driver's seat because of its expertise in design, connected cars, autonomous technology and electric powertrain, Morgan Stanley argues. This bold vision of a Tesla-dominated auto industry is why Jones dramatically raised his price target on Tesla. He now believes Tesla can skyrocket to $465 over the next 12 months. That's up 92% from Tesla's closing price of $243.15 on Friday. The stock jumped 5% on Monday to $254. The target is dramatically more optimistic than any other analyst on Wall Street. The mean price target on Tesla is currently just $254, according to FactSet. Just a few weeks ago UBS even slapped a rare "sell" rating on Tesla. UBS warned that sky-high expectations on Tesla mean that any significant hiccups will "likely cripple the company in the early stages of its growth." Jonas believes that within the next 18 months, Tesla will share plans for an app-based, on-demand "mobility service." Commercial introduction to this Uber-like service could occur in 2018, with the Model 3 serving as the backbone. The first version of this service would be human-driven, just like today's other ride hailing services. But then Tesla could move to a model where robots do virtually all the work even though real people sit at the driver's seat just in case it's required. Jonas predicted Tesla could transition to a fully autonomous service by 2025, that it would have nearly 600,000 cars in its global fleet -- or roughly the same size as Hertz (HTZ) today. "The holy grail of shared mobility is replacing the mistake-prone, fatigued and expensive human driver with a robot that drives with greater accuracy and precision," Jonas wrote. Related: Apple adds a Chrysler exec. Is a car far behind? All of this sounds pretty out there, right? Morgan Stanley seems to recognize how extreme its call on Tesla appears. The firm included an "important note" that emphasized the research is based entirely on hypothetical analysis and modeling by its analysts. Neither Musk nor any other Tesla representatives have announced a similar vision. "We understand the assumptions in this note may seem radical to some investors accustomed to the slow pace of change in a century-old auto business," Jonas wrote. He acknowledged there are very real risks to this Tesla-dominated future. The biggest include heavy regulation, adoption from skeptical consumers and competition from virtually all other auto makers and several tech companies. 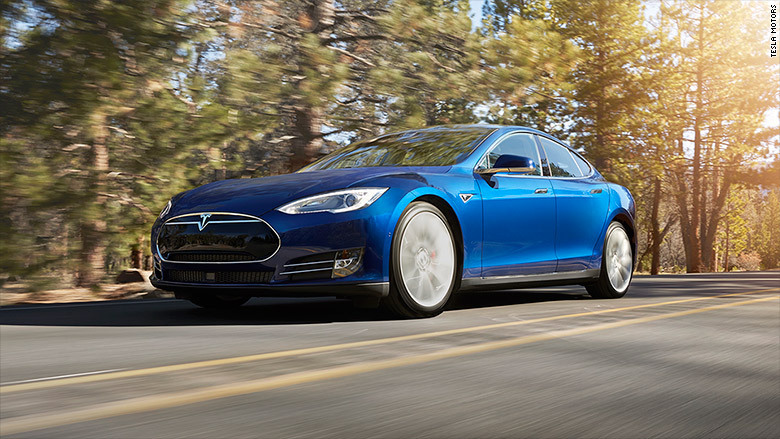 Tesla itself encountered tons of skepticism when it launched the Model S in 2012. Jonas notes that at that time no one had successfully launched an auto company in half a century, but today the Model S is a much desired car with the best overall rating in Consumer Reports' history and is the safest car ever crash tested by NHTSA.